Huayna Potosí is one of the many glacier covered peaks surrounding La Paz. It is part of the Cordillera Real with a mighty peak reaching 6088m above sea level and in a moment of cockiness we had decided that we wanted to conquer it. Conveniently, our chosen target was located just an hour’s drive outside the city. However, the road was so rocky, going there felt way farther away from civilization than that. We spend the first day at the base camp where our awesome guide Santos made sure we got enough carbohydrates in form of huge portions of pasta, rice and potatoes. He also gave us a crash course of how to use crampons and an ice axe correctly, without hurting ourselves – quite a challenge by itself already. The next day we hiked to the rock camp, located up on 5130m above sea level, higher than Europe’s highest mountain and higher than our feet had ever carried us until then – but not for long! Dinner was served at 5 pm and lights were out at 6 pm. As you might imagine, falling asleep at this time of the, well, day, is not so easy, especially when one of your mountain comrades is snoring like a buzz saw. Luckily for that guy, it was too cold to get out of the sleeping bag and hunt him down and luckily for us, breakfast was already served at 1.00 am. After that we started out, a bit sleepy still but fully equipped and in high spirits, towards the summit. Despite that Huayna Potosí is supposedly one of the easiest 6000m mountains to climb in the world, it was definitely no piece of cake to reach the summit. But with the help of lots of chocolate bars and our unbreakable Tyrolean power of endurance, we made it through our different ups and downs along the way, and eventually got there, just in time to see the sunrise. The view from the top was amazing: once the clouds below us had cleared up, we could see lots of other peaks, the lights of La Paz and even lake Titicaca – all of that of course, far, far below. After our little break of glory and satisfaction at the summit it was time again to descend. While hiking down we got to enjoy all the marvellous views of the glacier and its surrounding scenery that we had not seen while hiking up in the dark. However, going down we also noticed how steep the hike up had been. In the afterthought, it was probably quite a good thing to not have seen all that at first, that way we could concentrate on each step after the other. We got back to the rock camp at 8.00 am where it was time for “lunch”. Afterwards we could relax for a bit before embarking on the last hike of this adventure down to the base camp where “dinner” was served – at 1 pm. We had a hard time not falling asleep while eating. Luckily, soon after, we were brought back to La Paz where warm showers and cozy beds were waiting for us exhausted mountaineers. 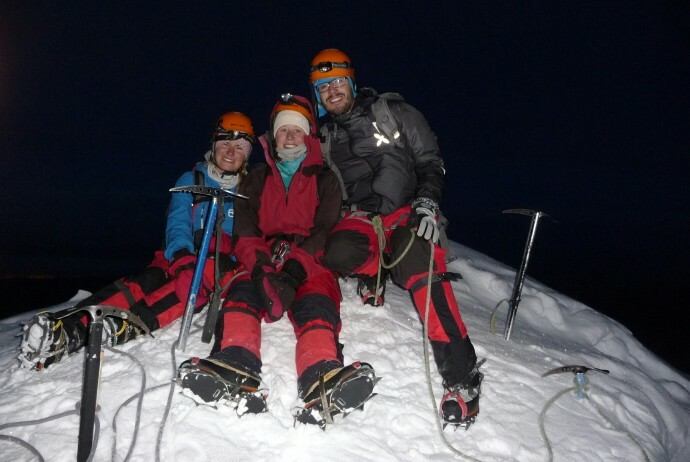 What to do: When in La Paz you can find tour operators offering mountaineering trips up Huayna Potosí on every corner. We picked the one operator that had Italian hiking boots – Albert Tours – and had a good experience, especially due to our amazing guide Santos. But pick whichever suits your preferences. Where to eat & drink: No need to choose thoroughly as options are limited and selected by the tour operator. However, bring lots of chocolate or other soul food. Copyright © 2019 Tales of Discovery. All Rights Reserved.